Beneath the skin of Johnston’s seventh dystopian whodunit is the threat of a revolution so virulent it could bring the whole series to an end. Enlightenment Edinburgh is still independent in 2034, but its citizens are sorely tempted to rejoin Scotland after “decades of violence and mob rule.” As he awaits the referendum that will determine his hometown’s fate, former City Guard Quintillian Dalrymple gets an urgent request from his old friend Davie Hume, the City Guard commander in charge of violent crime, to consult on the strangling of a Malaysian visitor in a missing prostitute’s home. Clarinda Towart of the Prostitution Services Department had every right to entertain Chung Kee Quee in the city’s central zone. So why did she take the trouble to break the law by smuggling him into the flat where he was killed? Battling as usual both the criminal element that threatens to engulf the city from below and the bureaucrats who are preying on it from above, Quint follows a torturous path that links the dead man to a strangled gangster, a family of dwarfs, a dangerous new toxin, and a legion of skeletons. But he can’t possibly guess how closely the mystery will be tied to the impending death of his own cancer-stricken father. Quint’s previous consultations (Heads or Hearts, 2015, etc.) have guaranteed high body counts, and this one is no exception. This time, however, the running battle between the lowlifes and the avowed guardians of the law is so widespread, uncompromising, and intense that it’s hard to see how either Quint or Edinburgh can possibly survive. The plot, which is even more labyrinthine than usual, will challenge the ingenuity, not to say the memory, of the staunchest readers. 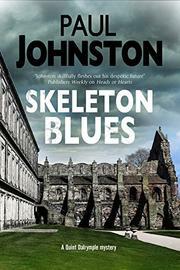 But Johnston’s nightmarish Edinburgh is so densely imagined that it’ll linger in the memory long after the plot is forgotten.